St. Patrick’s Day commemorates the patron saint of Ireland and the arrival of Christianity in the country. It also celebrates Irish heritage and culture in general. The festival has become widely popular among many people throughout the world, Irish and non-Irish alike. Celebrations generally involve public parades and festivals. Streets of all major cities are flooded with people wearing green attire, shamrocks or leprechaun costumes. But the best part of the holiday for most people is a good reason to meet up with old friends, go to a bar or a party and share a drink. Help your dear friends or colleagues at work celebrate St. Patrick’s Day in Irish style by sending a surprise they are sure to appreciate. A gift basket filled with an assortment of their favorite beers and snacks will be perfect for sharing with friends at a party. A selection of crunchy sweet and salty treats will complete the experience and help your recipients enjoy the gift even more. For those with a more sophisticated taste we have a lot of options with wine, champagne and other spirits and gourmet treats. Pamper the people you care about with a basket that’s overflowing with delicious gourmet treats. Your dear recipients will enjoy a bottle of Chianti DOCG Longo and Prosecco Superiore Valdobbiadene along with traditional Italian sausage, classic pasta, a panettone cake for dessert, and many more gourmet sweet and savory delights. 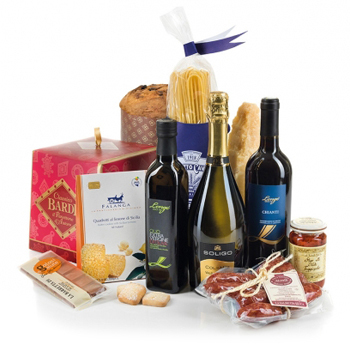 Make the next family get together even more flavorful, spice up your friends housewarming, or help your business colleagues organize a great corporate party at the office with the Delicacies from the Italian Countryside gift basket. Save $20 on your Gift to Israel! One of the most prominent Purim traditions is dressing up and wear masks. This custom is believed to have originated a way back and was influenced by the ideas of the Roman carnival. It’s not only fun, but also carries deeper meaning, including greater anonymity for charitable contributions. This original gift set was inspired by the Masquerade tradition and includes a beautiful golden Purim mask. 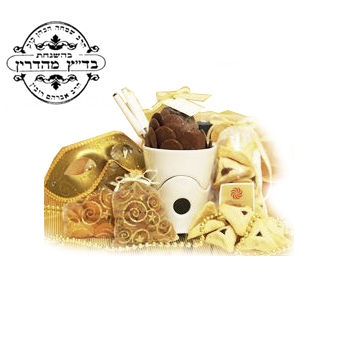 The gift will make the holiday not only festive and joyful but also extra sweet as it features a beautiful Porcelain Fondue set, dark and milk chocolate perfect for melting, and an assortment of dried fruit. Your lucky recipients will enjoy this delicious surprise for years to come – and they are sure to remember your love care and this holiday season. Save $20 on your Gift to Ireland! Presented in a stylish packaging, this gift is full of treats for those with a sweet tooth and natural teas selection for the person on your list who appreciates fine tea time in all its splendor. 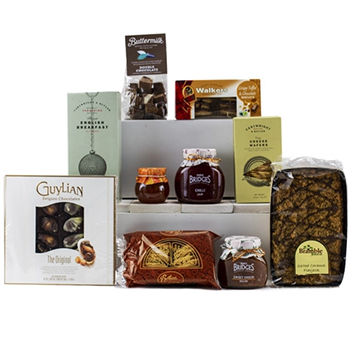 The hamper also includes delicious sweet treats that go oh so well with a cup of tea: Strawberry Preserve, Poppy and Sesame Biscuits, Rich Genoa Cake, Double Chocolate Chip Biscuits, Chilli Jam, Guylian Seashells, Apple Crumble Shortbread, Sweet Onion Relish and more. Let your recipients indulge and enjoy a relaxing cup of their favorite drink accompanied by sweet gourmet treats. Perfect for a tea break at work or family get together at home this Tea and Sweet Treat basket will make a wonderful surprise for a special occasion or just because. Save $20 on your Gift to Romania! Maybe Valentine’s Day is over but it’s always a good time for a romantic gesture! Treat your significant other to a romantic evening with everything they need to relax and enjoy themselves in the comfort of their own home. We have put together a collection of gifts presented in a pretty keepsake hamper. Your recipient won’t feel alone when they receive an adorable teddy bear, as they enjoy a night of pampering with spa products including aromatherapy shower gel, soap, fragrant candle, and so much more. Say “I miss you”, thank a friend, or treat a special woman in your life on International Woman’s Day with A Bit Of Cuddles gift basket. The most romantic holiday of the year, Valentine’s Day is here! All couples around the world are preparing exciting surprises for those they care about trying to make this day truly special and memorable. Surprise dinners at expensive restaurants, movie dates, romantic getaways are only some of the popular activities on February, 14. But Valentine’s Day is not only the holiday for lovers. Boys and girls, teachers and students, family member and friends also celebrate the occasion and exchange their greetings of affection and romantic gifts on this day. There’s no doubt that chocolate and red roses are considered to be the most popular gifts during Valentine’s Day. A red rose is considered the flower of love because of their color that stands for strong romantic feelings. In US alone almost 200 million stems of red roses are sold for Valentine’s Day. The chocolate started associating with the holiday thanks to Richard Cadbury from the Cadbury chocolates company who first presented his beloved one chocolates in a heart-shaped box. Now over 35 million heart-shaped boxes of chocolate worth of over $1 billion are sold every year for Valentine’s Day. Lunar New Year is the most important holiday in the Chinese calendar. Each year it falls on a different date according to the traditional lunisolar system based on the moon phase and the time of the solar year. In 2016 the celebration will start on February, 8 and will last for about 15 days until the middle of the first month. Normally, the biggest festival of the year requires some proper preparations. Before the holiday rings in Chinese people have a custom of cleaning their houses and displaying traditional New Year decorations. This long holiday is the perfect time for family reunions, which is one of the most important parts of the Lunar New Year traditions. People visit relatives and friends, go on vacation with dear ones, as well as do some shopping, watch traditional Chinese shows, launch fireworks, and make plans for the upcoming year. According to the Chinese 12-year animal zodiac cycle, 2016 is the year of the Fire Monkey. Great time for progress and changes it will also be a year of adventure, discovery and a lot of possibilities ahead. With the Monkey’s enthusiastic energy, anything can happen, plans and dreams can come true since the risks are minimal. Chinese people believe that a good start to the year will lead to a lucky year. And what is the better way to start celebrating then indulging in a delicious festive meal with dear ones! Treat your family, friends or business associates to a gift that will lift their spirits and start 2016 off right! From decadent wines that will compliment any toast, sweet treats and fruit for those with a sweet tooth, and gourmet gifts your dear recipients will have everything to ensure a prosperous New Year! Save $20 on your Gift to Portugal! George Bernard Shaw once said, ”There is no sincerer love than the love of food.” And while some may argue over this statement, we at GiftBasketsOverseas.com know for a fact that food has special place in every person’s life. It does not only give us energy we need to keep going day by day, brings delightful pleasure to our taste buds, but also carries precious memories associated with specific flavors and smells… Treat the taste buds of your dear recipients to a delicious adventure. There’s no need to be a connoisseur to enjoy a variety of traditional Portuguese treats gathered in this basket, such as Obidos Morello Cherry Liqueur Portugal Heart, Extra Virgin Olive Oil, Honey with Almonds, Sardines Tinned in Olive Oil, Pumpkin Jam with Walnut, and a Portugal Heart Chocolate Heart for dessert. Perfect for any occasion, this delightful gourmet surprise is meant for anyone on your list! Save $20 on your Gift to Germany! Love has many faces and one of the loveliest symbols of it is flowers. With this stunning bouquet comes romance and joy. For this abundant arrangement our local florists have picked only the brightest flowers under the sun: scarlet red Roses, bright yellow Gerberas, snow-white Mini-Cassa, Asclepias, Limonium, and other seasonal blooms. To complete the impression we’ve included an elegant complimentary vase and flower nutrients to ensure your recipients can enjoy your gift the longest. Celebrate your love this Valentine’s Day, say ‘Happy Birthday’ to your friend or significant other, wish happy anniversary or just say ‘I Love You’ in the brightest and most romantic way. Save $20 on your Gift to UK! Creating a perfect anniversary, birthday, Valentine’s Day or any other upcoming romantic occasion can be as simple as showing you care and remember. Our gift experts have worked to put together a gift that will take any plans you’ve made, and send them over the top. Your significant other or beloved friend will receive an adorable plush teddy bear, a box of mouthwatering world famous Lindt chocolates, and wonderful Egg Free Cake with a romantic message coming from your heart. Say I Love You, add to a romantic weekend getaway, or treat them just because with Mr. Bear and Friends gift set.